It's been over a week since my last salad post . I guess I could have been healthy and ordered a salad when I was out but I opted for steak and carbs instead. 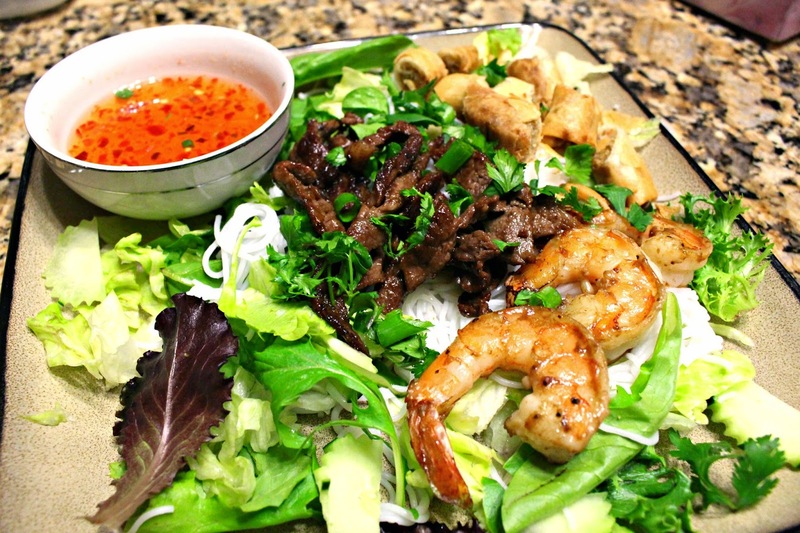 Today's salad is a traditional Vietnamese/Cambodian salad called "Banh hoi." There are different variations and "toppings" that could be used. Due to the eggrolls, it's probably better to prepare and eat on the weekend when it's fresh. Due to the high fat in the eggrolls and the sugar in the dressing, this is not a healthy salad. If you want to make it a bit "heart friendly ", I'd nix the eggrolls for some pan fried tofu and make an alternative lime cilantro dressing. Optional: Beef , shrimp, pork, tofu or chicken topping. Prepare noodles per instructions on the packaging. It usually involves boiling for 6-8 minutes then draining it and rinsing with cold water. Fry eggrolls for 10 minutes until inside is cooked. If using additional meat, seafood or tofu, prepare it to your liking. I love pan fried tofu, shrimp tempura, stir fried beef and my absolute favorite, roasted pork belly! Throw everything together and drizzle the tuk trey praem sauce over. Garnish with cilantro, mint and scallions. This is not a diet friendly salad but it does beat traditional fast food. I'm not even going to bother with the Weight Watchers points or calorie count.